Wayne State University Press, 9780814334225, 62pp. 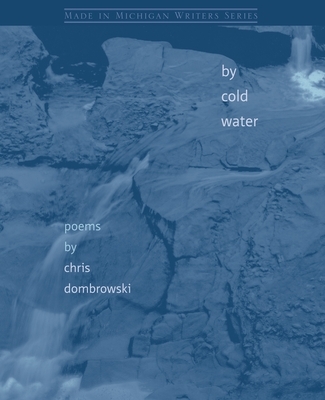 New from renowned Michigan-born poet Chris Dombrowski, By Cold Water is a well-crafted and confident collection of poems that journeys into a complex natural world that is both beautiful and threatened. In a measured and contemplative voice, these poems engage in an earthy and eloquent exploration of the landscape-including the lakes, rivers, moonlight, breezes, and birdsong-of Dombrowski's native Michigan and his current home of Montana. Always maintaining a sense of wonder at the world around him, Dombrowski uses these natural inspirations to produce a stunning range of meditations on modern life. Whether carefully observing the present moment or trying to make meaning out of the past, Dombrowski's lines showcase the struggle of giving oneself completely over to the experience. In a similar manner, his concise, powerful lines are all-consuming and honed to an exact sharpness, bursting with tactile, aural, and visual images. Though Dombrowski's work is rooted in nature, it is in no way limited by this focus. When he describes a star-filled sky, a sheet snapping in the breeze, or the season's first snow, Dombrowski draws readers completely into his world, to see how he has lived, loved, and survived in this particular place. In doing so, he skillfully reveals universal themes of growth and decay, uncertainty and faith, and love and loss, amid a landscape that is always evolving and fundamentally unstable. Dombrowski's voice is both inviting and sophisticated, its precision reminiscent of the best poets who have drawn inspiration from the natural world. All readers of poetry will be drawn to the rich and beautiful poems in By Cold Water. Chris Dombrowski's poems have appeared in numerous journals and anthologies including Colorado Review, Crazyhorse, Denver Quarterly, Orion, and Poetry. The recipient of the Associated Writing Programs' Intro Award, and other honors, Dombrowski has worked as a river guide, poet-in-the-schools, and teacher of creative writing at the University of Montana and at Interlochen Center for the Arts, where he served as writer-in-residence.